When the sun is out, it’s a perfect day for some outdoor fun that everyone can enjoy! Maybe you have an event with limited funding or you simply forgot all your game material heading out for camp. If there’s one thing that I’ve learned, it’s that kids can have fun with just about anything! How about these fun games with chalk? These are perfect for a sidewalk, parking lot, or backyard porch. Chalks are well loved by everyone especially little ones because it provides countless activities. And parents and youth pastors like chalk games because they don’t have to spend a lot of money. Cheap sidewalk chalk on Amazon. These fun games with chalk are easy to set up and very quick to clean up as well. You can play these games on almost any surface. Transform your roads and sidewalks making a boring day into an exciting afternoon. Now gather up some friends and let’s try these educational, thrilling and fun games with chalk! Using different chalk color, draw color blocks on the floor. Now allow all the kids to explore the area to find items that will match the chalk colored blocks. This game is not only fun, but also educational as it allows the kids to use their imagination and watchful eyes to look for items that will match the color blocks. You can make this game even more challenging by allowing each kid to create their own set of 5 colored blocks. READY, SET, GO and they will look for items to match their colored blocks. The first kid to fill all the colors up will win an amazing prize! Perhaps a box of sidewalk chalk? Keep your kids active while having fun with this sidewalk chalk game. Plot out the obstacle course by roughly drawing it on a piece of paper, or you can have the kids plot out their own course. The sidewalk chalk obstacle course should offer different activities like hopping, dancing, jumping, clapping and turning around. You may also include quick rests such as singing a song, making a wish, saying your name and so on. This game is not only exciting but also improves coordination, concentration and may even lower anxiety in kids. Here’s a clever version of the all-time favorite Simon says game. Just draw color blocks to represent the colors of the rainbow. You can draw them in a circular pattern leaving a wide space in the center. This space will be the spot where the player stands while waiting for the command. Start with the first color and add another. (Simon says blue, orange) The kid will jump to the first color and onto the next then back to the blank space. Continue each round by adding one color until you have 6-8 in the sequence. The game will end once the player completed the sequence or failed to follow the pattern correctly. Have you ever played the word factory game? It’s a toy with a 5×5 grid filled with letters that you shake and will find as many words as you can in 3 minutes! Amazingly, you can do a game with chalk similar to this one. Just draw a 5×5 grid at your backyard and fill it with letters randomly. Make sure that there are enough vowels and consonants. Now ready the timer and have each kid to hold a pen and piece of paper. They will have 3 minutes to go around the grid and find many words. This doesn’t only exercise their imagination, but also their spelling skills. Are you trying to think of a fun way to reveal amazing news or a gift to the group? Then, this game with chalk is perfect to help you with it! Using colored chalks, draw a line around the area. The kids will then follow it to find a gift or prize. You can also make it challenging by including other colored lines to confuse the kids on which line to follow. Or why not draw some lines on the floor and include roadblocks with questions and fun activities such as spell your name, sing your favorite song, jump in place, or variations of the other 4 fun games with chalk above. 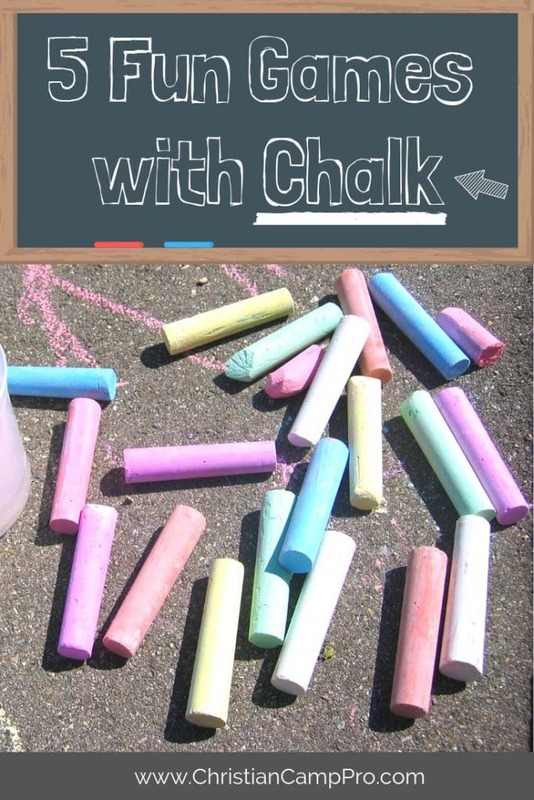 This fun chalk adventure game is very easy to prepare yet definitely an exciting! What crazy chalk line will you build? Finding easy activities to have fun with your kids or children’s group can be challenging, but with the help of these 5 fun games with chalk, you can definitely have a good time. Pick up a cheap box of colorful sidewalk chalk today and start having fun with your group! What will you try? Not feeling chalk? Try out these 9 Fun Games with Blindfolds! Special thanks to WOL Camps for making this article focusing on fun games with chalk possible!